Not to be confused with Cannon Canyon. Barrel Cannon Canyon is the fifth level of Donkey Kong Country. It is also the fifth and last regular level of Kongo Jungle. Donkey Kong skips a majority of the level from a secret Barrel Cannon. This level takes place in the jungle, and is considered the hardest level of its world, which it is the penultimate and longest one of. As its name suggests, Barrel Cannon Canyon involves blasting Donkey Kong and Diddy Kong across numerous abysses via Barrel Cannons and Auto-Fire Barrels. This also occurs in a later level, Rope Bridge Rumble. 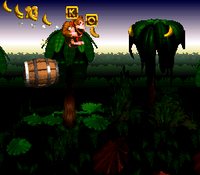 The Kongs must carefully time when to fire from some of the Barrel Cannons, or otherwise they fall down a pitfall. The Kongs can shortcut through portions of the level by blasting from an Auto-Fire Barrel on top of the level entrance, and then a few more from more Auto-Fire Barrels above treetops later in the stage. Each of these treetops are located in between two abysses with a chain of Barrel Cannons. Upon completing this stage, Donkey and Diddy can enter Candy's Save Point (or Candy's Challenge and Candy's Dance Studio in the Game Boy Color and Game Boy Advance versions respectively) and the world boss, Very Gnawty in his lair. Donkey and Diddy Kong begin the level by exiting a tunnel with an Auto Fire Barrel above it, which can blast them to a treetop farther into the level, where another Auto Fire Barrel is located that can blast them ahead to the second DK Barrel in the level. If the Kongs continue along the main path of the level, they can find two Kritters marching ahead of a Barrel Cannon that is able to fire them into the air and into the letter K. A ledge stands next to the barrel with a piece of the ground that the Kongs can land on to break it and reveal a DK Barrel. A cliff is ahead of here with a hidden area ahead of it, containing an Animal Token of Winky, and a piece of land is positioned behind the area that the Kongs can walk along. They are attacked by hopping Kritters as they move across this area, soon reaching a ledge with another Barrel Cannon at the bottom of it, which can blast them over a nearby abyss and into a pair of Kritters. The characters shoot past some Zingers. More Kritters walk in a lower area on the sides of a small pit. The pit is followed by a long, straight pathway with a few more Kritters and a raised piece of land on it. A Barrel Cannon sits on the raised ground, able to be used to blast into a barrel higher in the air that can carry the heroes into some bananas. An abyss containing four Barrel Cannons that move in horizontal paths when entered is ahead, and they can use them to cross it. As they blast over the pit, they fire past the letter O. The final barrel shoots them high into the air onto a treetop with a DK Barrel on it. The heroes can find an alcove ahead of here with a trio of Kritters hopping in it. They can also find an abyss soon after it that contains a mixture of many Barrel Cannons and Auto Fire Barrels, which move in either horizontal or vertical paths. The final barrel in this area blast the heroes over a long pathway and into the level's Star Barrel. The primates can find an alcove with a Kritter hopping in it ahead of here. A DK Barrel wobbles on a slightly higher piece of ground next to it. Two smaller alcoves are ahead, with two Kritters jumping around them. The second alcove contains a TNT Barrel that can be used to blast open the hidden entrance to a Bonus Level. A lower area consisting of a lone Kritter can be found nearby with a small pit after it. This pit is followed by a large area of land with a raised piece of ground in the center of it. Two Kritters jump on top of it, surrounding a barrel that can blast the heroes to an Auto Fire Barrel, which then sends them to a second Auto Fire Barrel. This barrel then blasts them onto a platform nearby, which contains the letter N that they can break out of it. If the primates do not shoot through these barrels, they come up to a pair of platforms in an abyss, the second platform being the one containing the letter N. A larger piece of land with a Kritter on it follows this area. If the Kongs manage to pass it, they can reach a wide abyss containing many Barrel Cannons and Auto Fire Barrels that move in horizontal and vertical directions. As they shoot over the abyss with these barrels, several Zingers fly in their way. Once they pass the foes and cross the abyss, they find themselves on a long piece of land with a few Kritters hopping along it. A sign indicating that the level is almost done also can be found on the edge of this area. The final Kritter in the level front of a tunnel nearby, located immediately after an exit sign. The letter G can be found on the treetops above here. If the primates enter the tunnel, they complete the level and head to the boss battle against Very Gnawty. Winky, Rambi, Enguarde Winky Token: Early in the level, after the first DK Barrel, Donkey Kong and Diddy Kong can walk to the right if it to find a cliff. Roll over said cliff and jump to reach a secret area containing the Token. Rambi Token: In the area with three jumping Kritters, jump on top of one to reach the tree above and proceed to the upper right to find the Token. Enguarde Token: In the second Bonus Area, accessible by blasting up the far left. Find the Exit! Right after the letter O, the Kongs must hop in a Barrel Cannon facing a wall while avoiding a nearby barrel across from them. The Kongs must shoot out of their barrel and slam into the wall. The wall breaks open and the Kongs enter the first Bonus Area. Here the Kongs must blast through several Barrel Cannons to the end. Items such as Bananas, Extra Life Balloons, and an Expresso Animal Token are located between the Barrel Cannons. Collect the Prizes! Shortly after the Star Barrel, the Kongs must find a TNT Barrel. They should pick it up and carry it to the nearest wall to the left while passing a Kritter They must break open one of the walls and enter a Bonus Level, where they begin in a barrel. As it moves them back and forth through the area, they must shoot out of it and grab some items in the three rows of collectibles. After claiming their prizes, the Kongs can miss the Barrel Cannon and fall below it to exit the Bonus Level. The Kongs must blast upwards in the first Barrel Cannon down the trail. The letter K is located at the very top of their blast. There are two letter O's, and only one is obtained based on which path the Kongs take. One of them is found by taking the Barrel Cannon shortcuts above the level, specifically located after the Rambi Token. The other one is located at the end of the first abyss to have both Barrel Cannons and Auto-Fire Barrels. 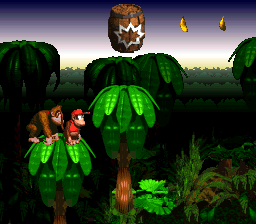 Shortly after the Star Barrel, the Kongs can find a Barrel Cannon that blasts upward in the direction of a moving Auto-Fire Barrel. It is surrounded by two brown Kritters. If they blast into the Auto-Fire Barrel, they automatically blast to another one, which then fires them down onto an item cache revealing the letter N.
The letter G is located on two treetops right before the exit. 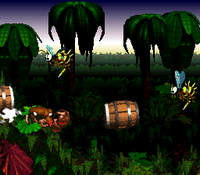 At the beginning of the level, the Kongs should pass the first two Kritters and shoot out of a Barrel Cannon to reach a higher ledge. If they roll jump off of the bottom-end of this ledge, they can reach a hidden platform holding an Auto Fire Barrel and an Animal Token of Winky. They should jump over the barrel to reach the hidden Warp Barrel, which takes them to a sign near the end of the level that indicates that it is almost over. This warp is only present in the Game Boy Advance version of the game. Donkey and Diddy encounter Kritters. The primates stand near three Bouncing Kritters. An additional DK Barrel was added near the letter N in the Japanese version. This page was last edited on April 5, 2019, at 12:21.